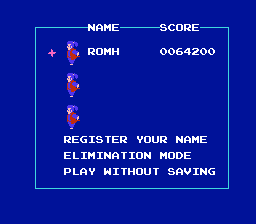 Nazo no Murasame-jou is an action game for the Family Computer Disk System. 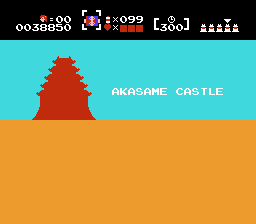 The Mysterious Murasame Castle was one of the first games made for Nintendo’s Famicom Disk System add-on. 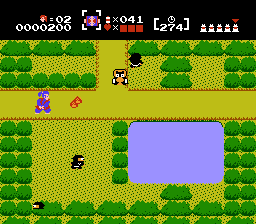 It would have been released at the product’s launch, alongside The Legend of Zelda, but development issues forced the game to be delayed to seven weeks later. 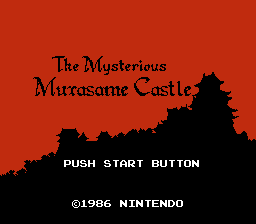 This no doubt contributed to its lack of popularity, especially compared to Zelda, and despite re-releases on the Game Boy Advance and the Wii’s Virtual Console, Murasame Castle has never been officially released outside of Japan. This is an English translation of Nazo no Murasame-jou for the Family Computer Disk System. Headered version of this rom is 2ACDE825. Patch MUST be applied to headerless version of this rom. If you apply it to a version with a header the FDS BIOS will give a "Disk Trouble ERR.25" and won't start the game. If you can't find a version without a header, remove the header below in a hex editor.